Well, my Polish chicks are growing. The only thing is, their crests seem to be growing faster than their bodies! Check out these hair dos!!! Aren't they great? We now have the chicks divided up into three separate tubs, and they are already getting really crowded. However, my mom and I want to keep them inside another week. They aren't completely feathered out, and we are supposed to have some low temperatures into the twenties this week. You can still see some fluffy chick down on the buffs in this pic. 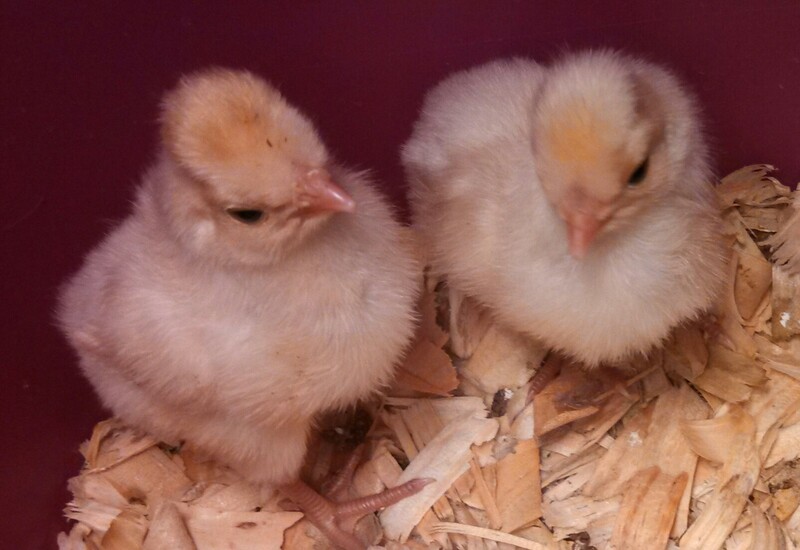 Since they are still indoors and are now a couple of weeks old, the chicks no longer need supplemental heat. But of course, we will supply a night time heat source by means of a red floodlight when we do move them to their outdoor coop. All the coop preparations are complete, we are just waiting for the weather to cooperate. For now, I am enjoying having them nearby and watching them grow and develop their own quirky personalities. This is a bit of a broad generalization, but the buff-laced seem the least "panic" prone so far. The silver-laced freak out over the least noise or movement, and the gold-laced are middle-of-the-road types. One little gold-laced roo is particularly inquisitive, and hops up to sit on the rim of the tub and watch the household activity. I'm going to miss their (constant) cheeping when they move to the outdoor coop. Well...maybe not so much! The chicks are growing as fast as weeds! We can already tell the males from the females. 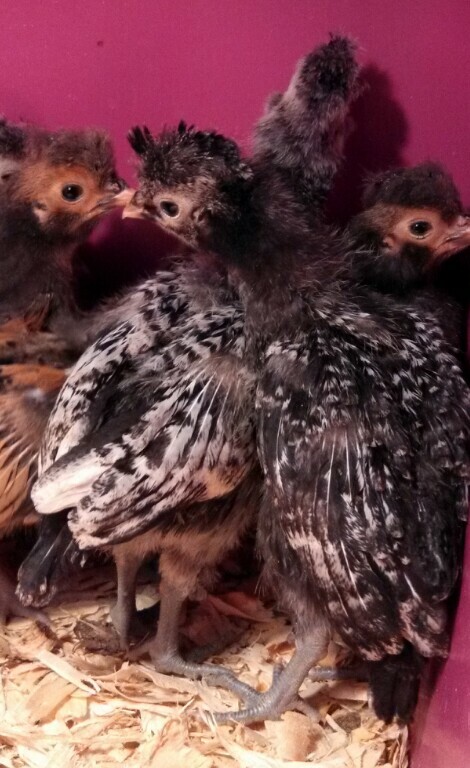 When polish chicks are a few days old,the pullets have a crest that looks like a fluffy cottonball. The roo's crests look like mohawks! With a little help from the folks on the Polish Chicken Fanciers facebook page, we estimate abot that we have half male and half female. Thank you for your help, fellow Polish lovers! 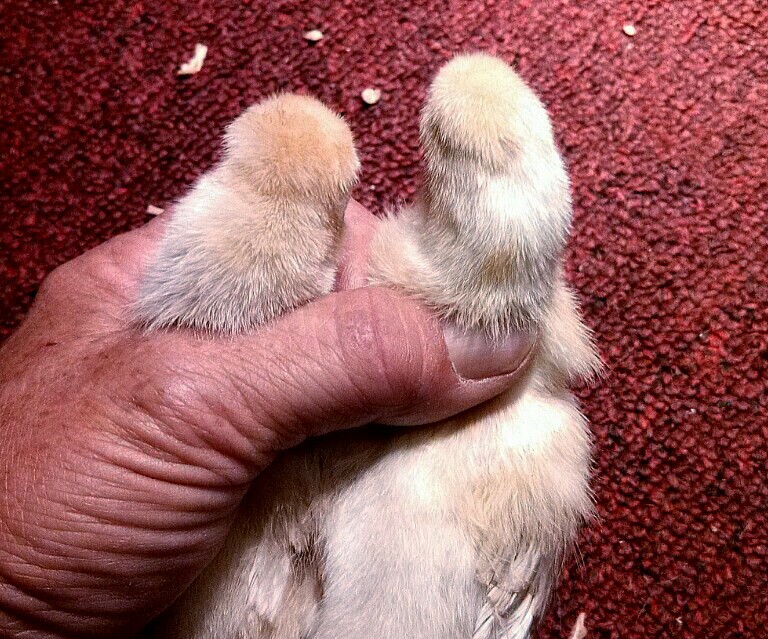 In this picture of two buff-laced chicks, the female is on the left. 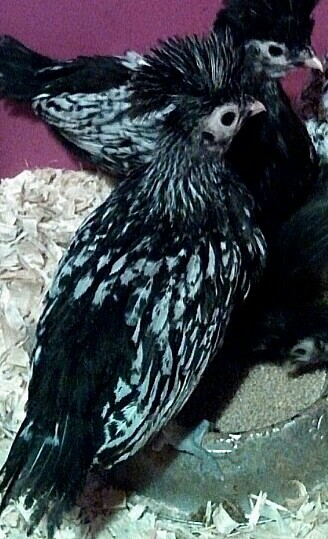 I can hardly wait to see how their plummage will develop as they feather out completely. The quality of feather color and pattern will have a big impact on which chicks I decide to keep as breeding pairs and trios. The chicks arrived on time after a month of eager waiting. 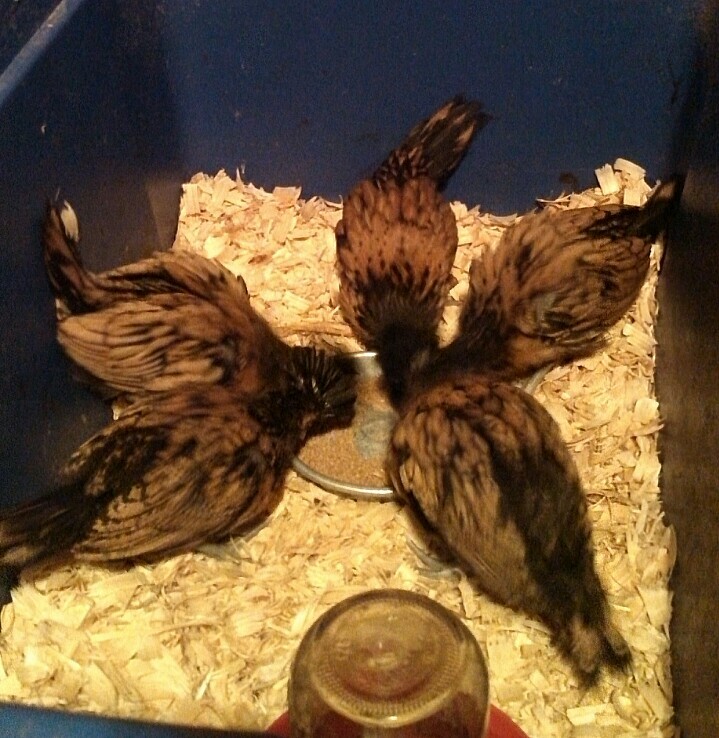 They arrived with no casualtys but, one poor chick had an extreme birth defect. He arrived with a serious crook beak. Mom had to humanely dispatch the chick because, he would die of starvation. The crook beak wouldn't allow him to eat. 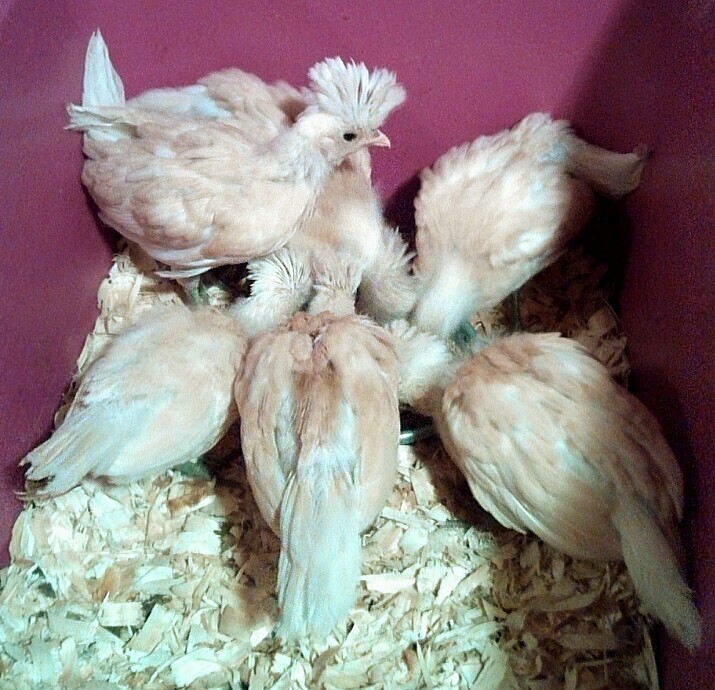 I ordered 18 chicks, 6 each of buff laced, gold laced and silver laced Polish. The gold laced are my favorites. I am hoping to get at least one nice breeding pair (or trio!) of each to start my Polish project. Later, I intend to add a frizzle. Those crazy feathers just crack me up! The rest were uninjured and arrived safely. Or brooder set-up is simple: a large plastic tub with a wire cover, with a brooder light on top. We have use a bright 60 watt bulb to keep them warm on cold fall nights. After a week of so, we will change to a 40 watt bulb for two weeks, followed by a 25 watt red bulb. The red color helps keep them from pecking at each other as they will do when they get a little older. Soon they will become larger and more active. One day they will be bred to produce newer, brighter, richer color feathers, and add white eggs to the color spectrum of eggs in our basket! Those who follow us have already met our son, Colt. He is active in most of our farm activities, but enjoys the chickens most of all. For his 4H project this year, he asked to have his own particular breed of chickens. He chose the Polish breed for their wacky good looks and clownish personality.